One of my “fun” personal quirks is that I’m ultra organized and detail-oriented. Those tiny details that most people ignore and look past in any given project? They were probably what I thought of and planned for first. It’s kind of extreme, but it’s totally why being a developer for designers has served me so well. 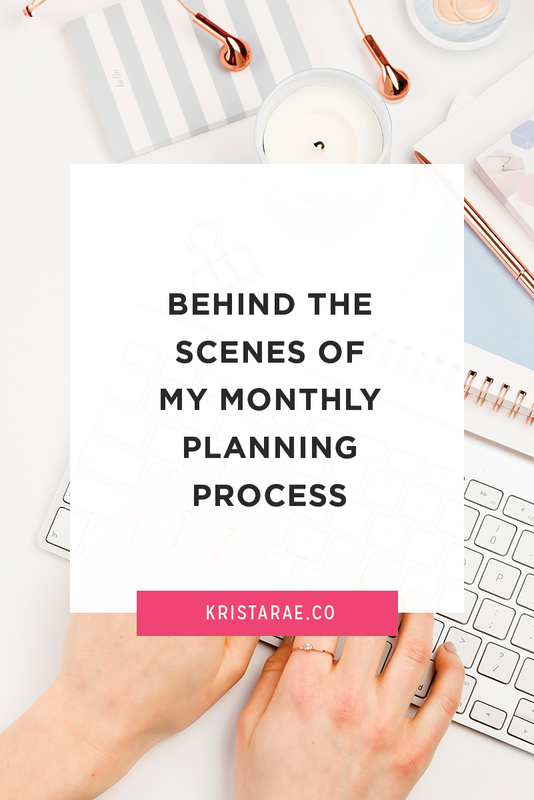 But…there has been a place I’ve been slacking when it comes to organization and details and that’s what I work on from month-to-month. When I was doing my 2019 planning I realized that “intention” was my cheesy, overused word of the year. 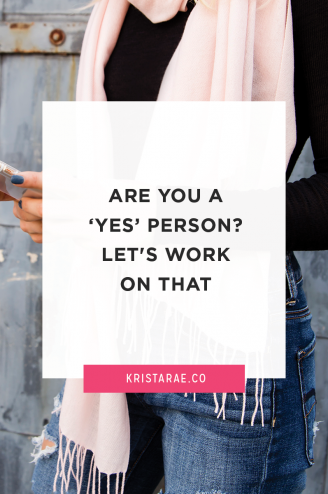 In 2018, I said “yes” far more than I wanted to just because it’s what comes naturally to me. When I was thinking more on that word, I realized that my work had become about as far away from intentional as it could get. I’d sit down each day, take care of client work, and stay busy outside of that, but with tasks that weren’t doing a whole lot for me. So in late-January I did my first “monthly planning day”. And you guys, it was so good. Now, rather than winging it after I finish up client work for the day, I know what other tasks I need to work on to reach the goals I’ve set. That means no more being reactive to emails, saying “yes” when I don’t want to, overbooking myself with side projects, or feeling panicked like I need to be working on something, but not knowing what that something is. And because this process was so amazing for me, I’m going to share it with you! As a disclaimer, I’m totally not a planning expert. The process I’m about to show you is what felt right for me at the time and it turned out really well. I’m sure I’ll tweak it a little each month. 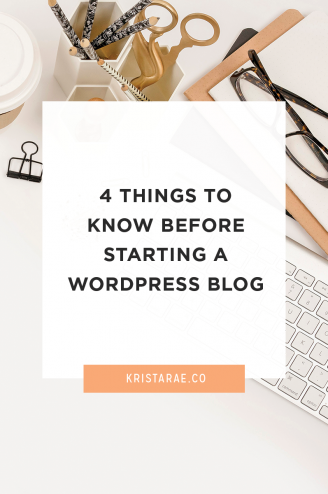 The first step I took was to choose where in the house I wanted to do my planning. I work at my desk 99% of the time, but I knew it wouldn’t be the best fit for this since I had a lot of supplies, I wanted to spread out, I needed a space that allowed creativity to flow, and I didn’t want to be distracted by my computer and get pulled into client work. I ended up choosing our living room – a nice, big open space with lots of natural light. Next, I loaded up all the supplies I wanted from my office and hauled them out to my designated planning space. After I had everything set up, I started with a simple brainstorm. I knew I had too many goals, ideas, and commitments for February so I listed them all out to start. 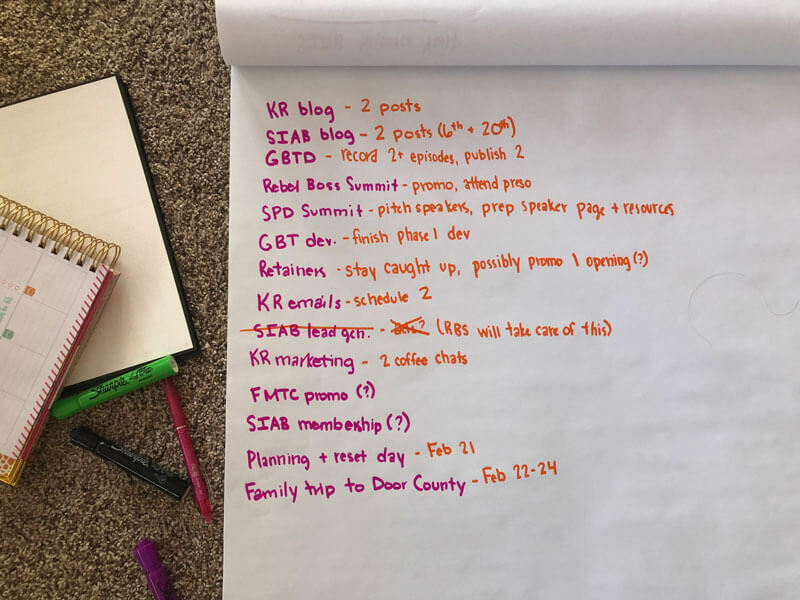 Looking at my initial list I knew that I had a bit too much planned, but I felt more drawn to brainstorming so I wrote out a few details for each task. Nothing major, but enough that I’d have some direction when I started to move things to a digital format. Even though I have a hard time waiting on things I’m excited about, I felt really good once I decided to take those extra tasks off my plate. If you don’t have PowerSheets, you can’t do this exactly, but there are still a few steps you can take from it. It was really nice to take that time to celebrate what I accomplished in January and the Prepare Well page caught a couple of things I missed. After I filled out my tending list I felt like I had a solid direction for the personal side of things as well. 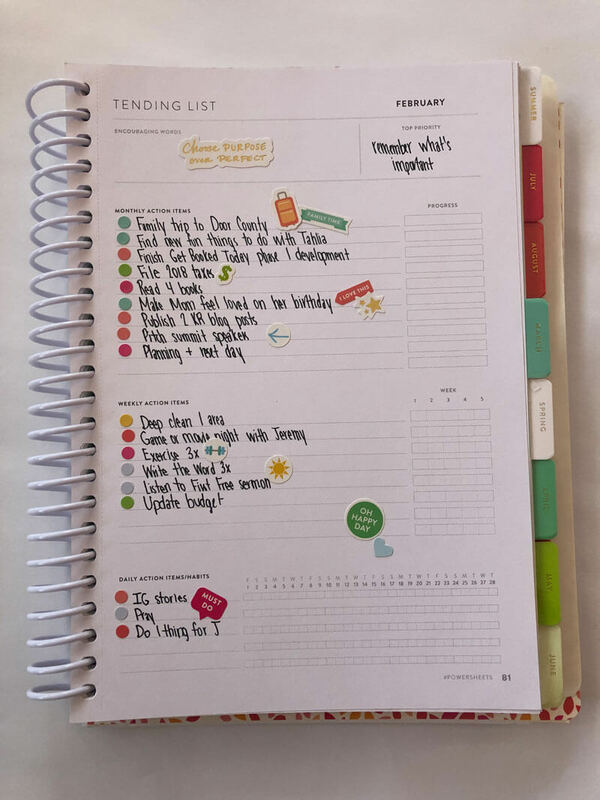 I’m all about time-blocking so my next step was to look at my goals and decide how much time to allow for various tasks throughout the week. 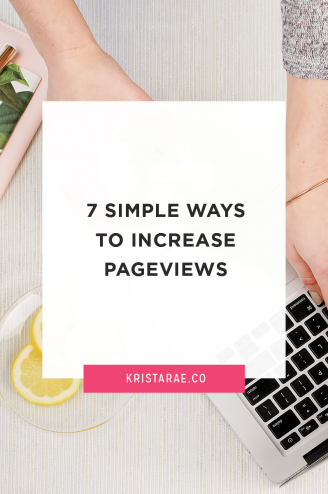 Marketing – writing blog posts and newsletters, coffee chats, connecting with people, etc. After the last couple of steps I finally had a good handle on what I wanted to accomplish in February so I put it in my schedule. I actually started with a big paper monthly calendar and played with due dates for different tasks. 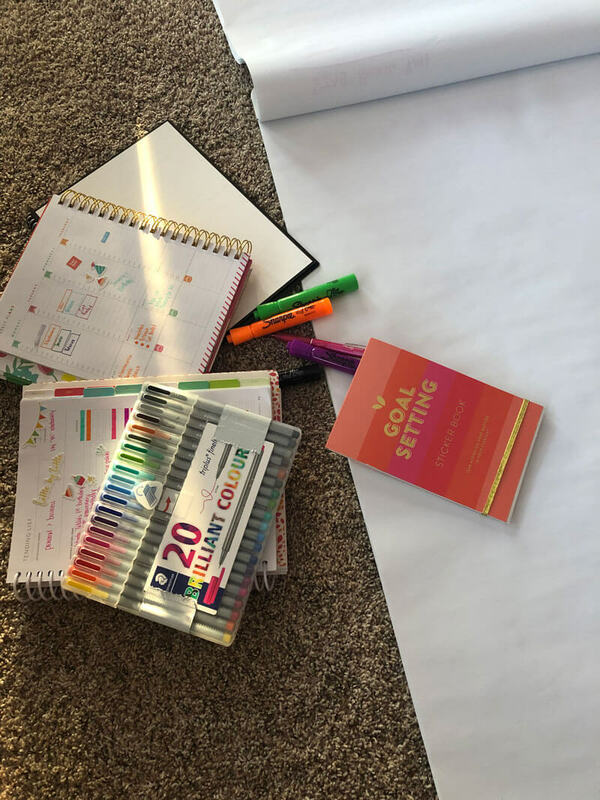 After I had a schedule that made sense, I moved to Asana and Trello (I use Trello for myself and Asana for clients + my team) and got everything scheduled! 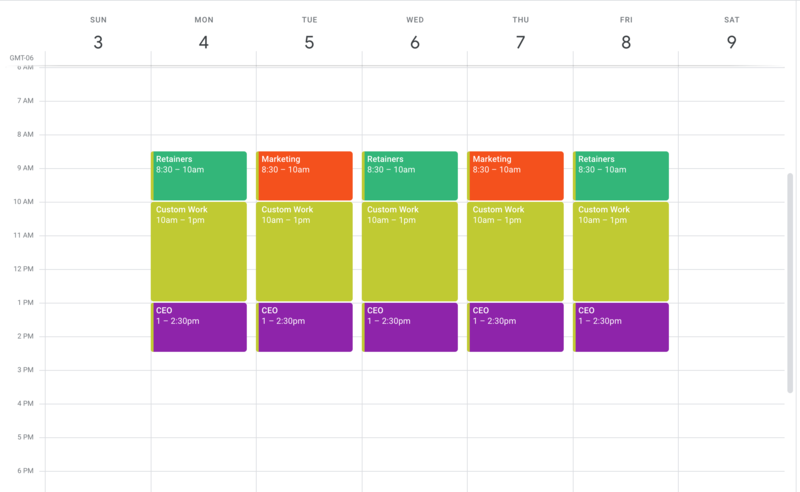 I broke large tasks into smaller ones, moved due dates around so everything fit, and ended up with a solid plan for the month. I love how this monthly planning day turned out more than I thought I would. It feels so good to be going through the month with intentions outside of client work. I know the tasks that I’m doing will actually pay off down the road. As for what I’d do differently next time, I haven’t figured that out yet. This felt like a drawn out process, but I did feel like each step was useful and since I had an entire day set aside (and will continue to do that), I don’t see any need to rush the process. One thing I’d like to do is condense my calendars and planners. Right now I use Trello, Asana, Google Calendar, and a paper planner. I know it’s kinda ridiculous, but they all serve different purposes for me. Maybe that’s something I’ll tackle in planning day #2! If you incorporate any of this into your own monthly planning, shoot me a message on Instagram and let me know! I’m all ears if you have any tips of your own as well! 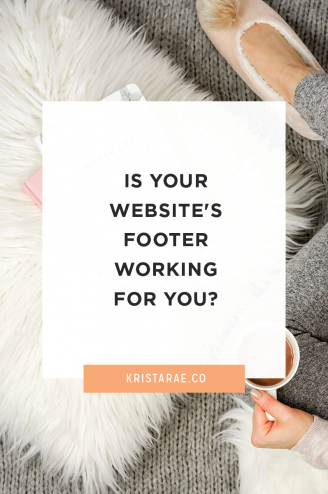 Is Your Website’s Footer Working For You?